Everyone knows what a watermelon fruit looks like, but far fewer can recognize the vine from which it grows. Watermelon (Citrullus lanatus) is a sun-loving tropical vine that has distinctively lobed leaves of a light green color. They feel hairy, as do the whitish pale green stems. The flowers are yellowy green and are pollinated by bees, leading to the formation of the first round fruits of solid green that elongate and show the characteristic mottling or stripes of light and dark green. Look at the habit of the plant you think is a watermelon. 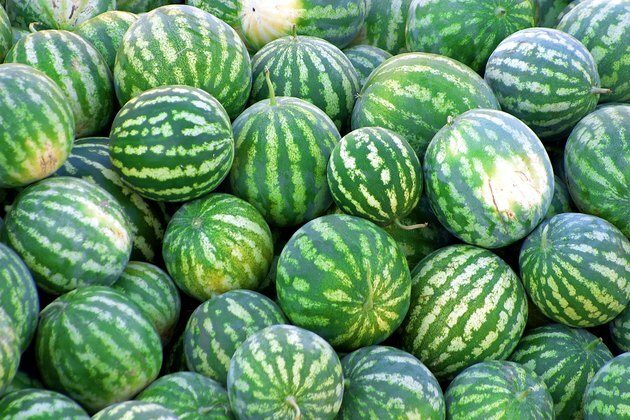 Watermelons are vines, usually sprawling across the ground in a sunny location. At maturity, each vine is 10 to 15 feet in length, from stem base to vine tip and has tiny tendrils, or thread-like curling stems at leaf bases. Note the time of year. Watermelons prosper in warm temperatures and do not survive frosts. If it is early in spring when temperatures are still below 60 degrees F, or in autumn after a frost has occurred, chances are the vine you encounter will not be a watermelon. Look at the vine's foliage and feel its texture with your fingers. Watermelon leaves are light green with a hint of silvery white in their color. More importantly, the leaves are deeply lobed, having three to five finger-like lobes that have coarse rounded teeth. The leaves will have a gentle, sandpapery texture. Search the length of the stem for any flowers or fruits. The flowers are yellow and occur singly, and look like papery petunia-like blossoms with five united petals. Flowers occur at the newest parts of a vine, usually at the tips, while further back on the vine you may encounter a green, smooth, round fruit that is developing. The skin of the fruit may or may not yet have dark and light green spots or irregular striping. Cut open a fruit. The flesh of a watermelon is easily recognized when nearing ripeness, with the red flesh and black seeds. However, young developing fruits' flesh is pale green to white with small white seeds. My Grapes Have Been Green for Sometime How Can I Ripen Them?